As President of this service corporation, it seems to matter that you know I am a Vietnam veteran and this is a free community service offered to most all adults seeking help through Peace and Conflict Resolution.Org (P&CR.org), for which I am a volunteer. Our hypnosis services are built around your personal enjoyable experience during past life regression therapy, and mitigation of matters you seek help in relieving. Since you sometimes remember little after emerging from somnambulistic trance, we record the session for you. We tackle many issues all the time: Physical Problems, Trauma, PTSD, Missing Time, Exploration by the Inquisitive, and Finding this Life's True Purpose. We also have an Outreach to innovatively organized and run Correctional Facilities that are able to encourage their inmates in finding transformative breakthroughs. We find when one experiences a moving revelation on the spiritual level during regression hypnosis, as to life's true purpose, for example, it seems to open a doorway to a release of anxiety, a humbling-of-self, leading towards self-forgiveness, forgiveness of others, a sense of gratitude, a grace of spiritual awakening that settles upon one, and the emotional attunement realized by a release of fear. This creates a strong and new foundation for the daily pursuit of personal growth leaving behind those aspects of ego that blind one from finding truth, love, and compassion. Clients use us for Health, COPD relief, PTSD, Missing Time, Relationships, Changing Habits, Wellness, Forgiveness, Stress, Pain Management, Phobias, Insomnia, Spiritual Growth, Self Confidence, Grief, Relief From Panic Attacks, Achieving Goals in Academics, Career, Athletics, Life, and Removing Blocks to personal progress, Meet Your Personal Spirit Guide and dream interpretation. This service is free of charge. We strive to enable you to find your inner "Fix-it Switch" to find the relief and changes you seek. The technique uses past life regression as a tool to enter a conversation with your Subconscious (It works sort-of like this Bob Snow's audio tape, but we take it further to reach and communicate with your Subconscious): LA Detective Bob Snow. Bob started regression hypnosis out of a cocktail party suggestion and wasn't seeking relief of any sort, whereas you probably have specific goals or may just be curious. Unless stated otherwise in writing, we are not rescuers, medical doctors, psychologists, nurses, psychics or trained health care professionals. Rather we are well trained hypnosis guides and technicians conversant with hypnosis techniques and very informed on its usefulness and applications. As principal volunteer service provider of Peace and Conflict Resolution.Org, for most of my life I studied and was engaged in engineering, aviation (Vietnam US Marine jet pilot), construction, banking, appraising, business sales, finance and real estate sales, leasing and development. I personally still maintain a practice in most of those fields. Through P&CR.Org, where I serve as a volunteer service provider, I personally provide free, deep-somnambulistic trance regression hypnosis that strives to take you into vividly experiencing and reliving transformative, seemingly real past-life(s) selected by your Subconscious and/or real past events in this current life you seek to investigate. You do not need to believe in reincarnation to successfully use this service. We move you into a state of objective observer so you do not personally experience trauma, but observe and evaluate its roots, meaning and significance. We then work with your Subconscious to help you heal yourself. We work to guide you to the healing place and your Subconscious actively organizes the solutions appropriate to your needs. Often the Subconscious will allow you to see and report a past life trauma that carries forward, manifesting itself in this life after piggy-backing on stressful current life events sharing commonalities with stressful past life experiences such as mortal combat, sexual abuse, and other extremely stressful experiences. For example, dying of starvation in an earlier life can pattern you to over eat, feeling hungry all the time in your current life, leading to all sorts of over-eating health issues in this life. Being burned at the stake or dying in flames in a past life, or a mortal wound, sometimes transmutes through into your current life as facial or body birth marks. Sometimes birthmarks can be mitigated noticeably. Taking a vow of chastity in a former life can create sexual dysfunction in your current life, this is very common. Such a vow is a soul level vow that can usually be dropped in this life with help from your Subconscious that the former life vow has expired with the ending of the former life. The Subconscious has no sense of time and often does not know what body you are living in. It needs to be reasoned with as one reasons with a child, lovingly, patiently, and respectfully. Drowning or being drowned in a past life may come through as an unreasonable fear of water in this life. Death during combat in a past life, or torture, intense combat related stress in a past life, may all have unique battlefield sounds, stress patterns, even visuals each identical in some way to sounds of combat you heard on the front lines of mortal combat in this life, triggering PTSD episodes rooted in a past life. Imagine this: Flash-backs into a former life's trauma is also possible. Can you imagine the mental confusion this would cause? How would one ever know what was being experienced now? Missing time issues when you sense something happened and you can not remember. Your Subconscious knows. Once your interior Fix-It Switch turns itself on through your Subconsious it's work seems miraculous. Sometimes it takes more than one session for your Subconscious to trust the hypnosis practitioner. It will show us some of your resting lives first, where not much happens, holding back the traumatic life until it gets comfortable with the idea of directly communicating with the hypnotist. I know this must sound strange. Usually the Subconscious will show us exactly what is needed in the first session. Your Subconscious knows everything about you.... everything. You may not be contacting us for relief from PTSD. That's fine. You may not be a veteran, that's fine too. Most people want to know their true purpose in this life. 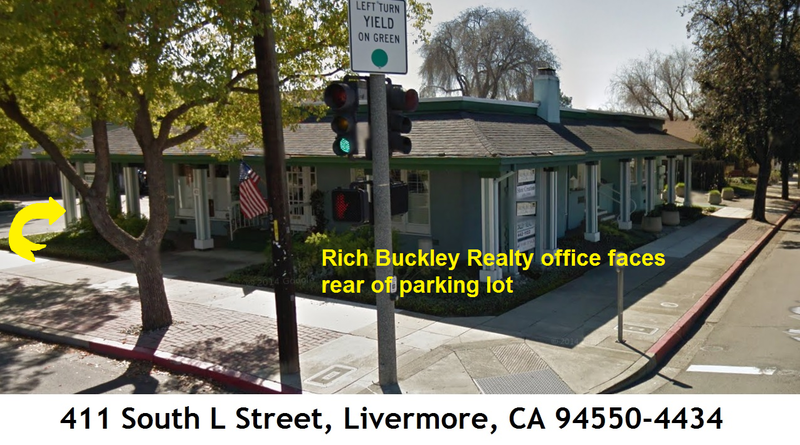 Our office is located on the corner of 4th and South L, Livermore, CA, in route to where a lot of Veterans go by each day to reach the still very busy Livermore, Ca, VA Hospital and PTSD is a huge health issue we Vets can help each other through. We emphasize discussions on PTSD, should you want to give past life regression a try. Our task as your guide, in part, is to work to gain the trust of your Subconscious and ask it to release you from the unwanted on-rush of fear, dread, emotional exhaustion you are suffering with PTSD. We greatly respect and honor your Subconscious at all times, otherwise your Subconscious will just shut down and not respond to us. Your Subconscious knows everything about you in this life and all other lives you have ever lived. You do not have to believe in past lives for this process to work. Your Subconscious will not allow you to experience anything you are not ready to experience. At this sought, deep level of trance you will usually not remember the details, hence we record it. You can then, later listen to the answers we uncover as strange as they may seem. They often become life changing just as you seek. Your Subconscious can do anything. I've seen it rebuild missing cartilage in bone-on-bone knee contact within hours, a repair science is only now beginning to understand with advanced stem-cell therapy. In the final analysis you are healing yourself through this process drawing forth healing powers resident within you. We seemed to have found a way to call forth the placebo effect through somnambulistic hypnosis and working directly with your Subconscious as P&CR.org in-house practitioners have been trained to help guide you to experience. The mainstream pharma industry refers to a human phenomenon of spontaneous health improvement during drug testing as "the placebo effect," when no drug is actually taken and a benign substitute is switched and given to the patient, yet health improvement occurs. Our form of regression hypnosis (learned from the well known master, Dolores Cannon) seeks, without drugs, to work to open a direct communication with the immense, apparent, managerial power inside each of us, an intelligent power apparently in-charge and controlling this otherwise little understood placebo effect. Perhaps a better understanding of "placebo effect" is to say the "effect" appears to be the results of a flow of "grace" realized deep in you as a soul-level, heart-felt humbling awareness of a life force from the highest of heavenly realms discussed here by our dear friends Wynn Free and Terry Brown. Listening to the song "Amazing Grace," is helpful in placing your state of mind into a meditative communication to call upon the help of Grace. "The beauty of this technique is that anyone can do it without prior hypnosis experience. We have found that the only requirement is to have an open heart and the desire to help people."... Dolores Cannon. We believe the Quantum Healing technique can help with many issues including diabetic nerve pains, phantom pains, PTSD (also Vet Video's on PTSD), depression, finding personal enlightenment without drugs and even some cancers. If the parts aren't missing we can work with you. If they are missing and causing pain, we can often work with you to help stop the pain. 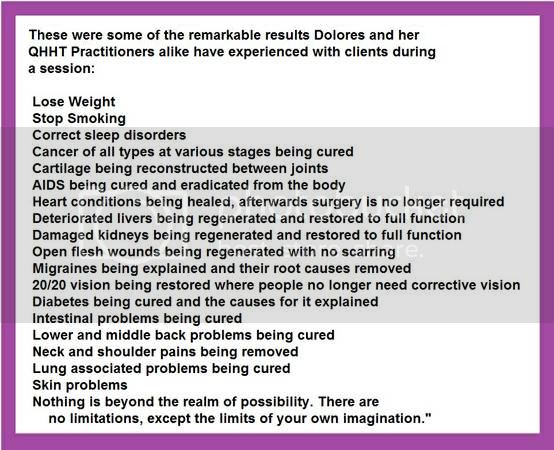 There are no guarantees, but these are some of the remarkable results Dolores and our QHHT Practitioners alike have experienced with clients during our sessions. Here is more information on injuries helped with QHHT sessions: http://tinyurl.com/oddm8sl. Your session is confidential. Your name will be held confidential. We use the data to help others and write and report advancements, discoveries and findings in QHHT work. We use the work to advance healing, promote services, and facilitate operations. Simply watch this video I posted here and follow the simple suggestions listed. Your list of concerns and this interview are confidential. We need a space of privacy, access to a restroom for both of us and a little time to assimilate your needs upon our initial meeting. We usually need several days lead notice to work you into our schedules. Sometimes we can pop right to and provide service on the spot. We try our best. Except in the case of gross negligence or malpractice, I or my representative(s) agree to fully release and hold harmless Richard W Buckley ("Rich Buckley"), Peace and Conflict Resolution.Org, (name of hypnotist: _________________________) from and against any and all claims or liability of whatsoever kind or nature arising out of or in connection with my session(s). Your name will be held confidential. Please print out this web page and sign and date it and bring it to your private session. The hypnotist will ask for it before starting the actual session. DISCLAIMER The information provided on this website should not be used during any medical emergency or for the diagnosis or treatment of any medical condition. Call 911 for all medical emergencies. This information does not constitute legal or other professional advice on any subject matter. A licensed medical professional should be consulted for diagnosis and treatment of any and all medical conditions. Links to other sites are provided for information only – they do not constitute endorsements of those other sites. 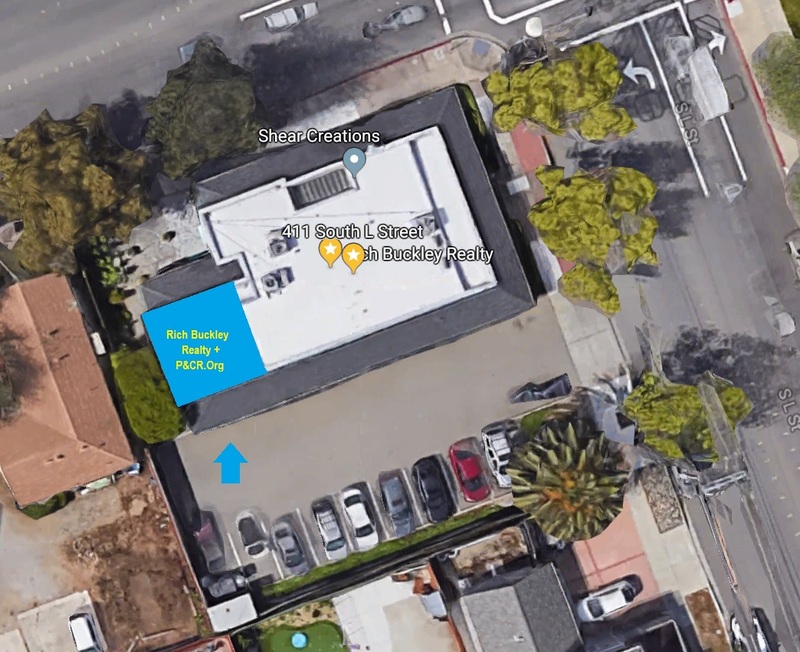 While the information contained within this website is periodically updated, no guarantee is given that the information provided in this website is correct, complete, and/or up-to-date.